The Baltimore Symphony Orchestra’s season at its second home, the Music Center at Strathmore, opened Saturday evening. Before the second half, music director Marin Alsop introduced the 10 new musicians who have joined her ensemble’s roster since the second half of last season. This includes new principal clarinetist Yao Guang Zhai, who comes to Charm City from the Toronto Symphony Orchestra. For the traditional playing of the national anthem, Alsop turned not to the newly commissioned arrangements of recent years, but one made by Igor Stravinsky as a gift to the country that adopted him during the Second World War. A few harmonic oddities, restrained for Stravinsky, enlivened the familiar tune. It complemented the bonbon that followed it, “Bachianas Brasileiras No. 5,” by Heitor Villa-Lobos. Julia Bullock’s clear soprano had a subtle intensity, beauty behind a veil. The eight cellists on the accompaniment, though, did not always agree in intonation. With the adjustment in membership, it may take some time for the BSO to regain its most cohesive sound. The orchestral passages of Gershwin’s Concerto in F were a little uncoordinated rhythmically. The beat must be absolutely clean so that the jazz-infused rhythm can swing against it. It was not quite. 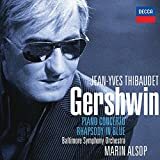 The high point was the solo playing of pianist Jean-Yves Thibaudet, smoky insouciance that felt like improvisation, as well as the bluesy trumpet solos in the slow movement. Thibaudet’s tendency to rush to the downbeat in challenging passages further unsettled the piece. Alsop has decided to focus much of the season on the music of Beethoven. Again. Her urgent, overly fast tempo made the first movement of the composer’s Fifth Symphony a nervous blur, but the second movement felt bracing in its lack of sentimentality. In the third movement, she emphasized strong contrasts of loud and soft, a good setup for the surprise eruption of the finale. Incisive piccolo solos helped give the conclusion a martial edge.